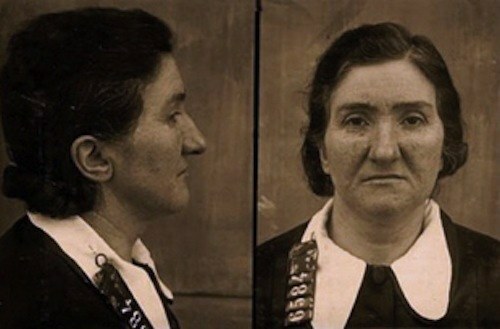 Leonarda Cianciulli is an Italian female serial killer, also known as "Soap-Maker of Correggio" who murdered three people. Correggio"s murder spree lasted between 1939 - 1940. Cianciulli turned their corpses into soap and teacakes. Cianciulli was known in her town as a gentle woman who as a little girl attempted suicide twice. Cianciulli had seventeen pregnancies while married to Raffaele Pansardi, but had three miscarriages, and ten died at an early age. Of her remaining four children, she was very protective. Cianciulli started her crimes by trying to protect her eldest and favorite son, Giuseppe, from joining the Italian army for the start of World War II. Cianciulli came to the notion that she required human sacrifices to save her son, and three middle-aged women were selected: Faustina Setti, Francesca Soavi, and Virginia Cacioppo. Cianciulli was thought of something similar to a fortune teller or seer. Faustina Setti was the first of Cianciulli"s victims who came to Cianciulli for help in finding a husband. Cianciulli told her that her husband awaited her in Pola and she needed to make arrangements to leave for Pola without telling anyone beforehand of her plans. Setti was instructed to write postcards for relatives and friends telling that everything was fine to be mailed after arriving in Pola. Setti came to see Cianciulli on the last day and received a glass of drugged wine that she drank. Cianciulli killed Setti with an axe before dragging her body into a closet. Cianciulli cut Setti"s body into nine parts and gathered the blood into a basin. Some sources report that Setti"s life savings of 30,000 lire were given to Cianciulli as payment for services rendered. Francesca Soavi was the second victim who was also persuaded to write postcards to be sent from Correggio. Soavi was promised a job at a school for girls in Piacenza. Soavi was also drugged with wine and killed by an axe and dealt with in the same way as Setti"s on September 5, 1940. Cianciulli is said to have received 3,000 lire as compensation for her services. Virginia Cacioppo, former soprano, was the final victim of Cianciulli on September 30, 1940. Cacioppo was promised a job as a secretary in a mysterious impresario in Florence. Everything after that was the same as the previous two girls. Cianciulli reportedly received assorted jewels and 50, 000 lire. Cacioppo"s sister-in-law reported her suspicions to superintendent of police Reggio Emilia. Police immediately opened an investigation on Cacioppo, who confessed to the murders and detailing the events. Cacioppo showed no remorse and was quite bold about the killings. Cacioppo was found guilty and sentenced to thirty years and three years in a criminal asylum. Cacioppo died of cerebral apoplexy in the criminal asylum in Pozzuoli on October 15, 1970. I threw the [body] pieces into a pot, added seven kilos of caustic soda, which I had bought to make soap, and stirred the whole mixture until the pieces dissolved in a thick, dark mush that I poured into several buckets and emptied in a nearby septic tank. As for the blood in the basin, I waited until it had coagulated, dried it in the oven, ground it and mixed it with flour, sugar, chocolate, milk and eggs, as well as a bit of margarine, kneading all the ingredients together. I made lots of crunchy tea cakes and served them to the ladies who came to visit, though Giuseppe and I also ate them. Leonarda Cianciulli serial killer is a female serial killer. Soap-Maker of Correggio is a female serial killer.